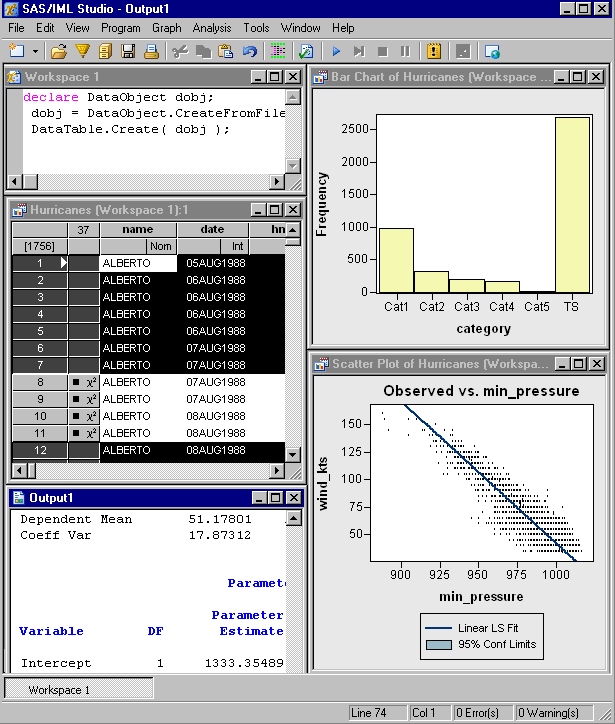 SAS/IML Studio is software for statistical programming. It provides a highly flexible programming environment in which you can run SAS/STAT or SAS/IML analyses and display the results with dynamically linked graphics and data tables. SAS/IML Studio is intended for data analysts who write SAS programs to solve statistical problems but need more versatility for data exploration and model building. The programming language in SAS/IML Studio, which is called IMLPlus, is an enhanced version of the IML programming language. IMLPlus extends IML to provide new language features, including the ability to create and manipulate statistical graphics, call SAS procedures as functions, and call computational programs written in C, C++, Java, and FORTRAN. SAS/IML Studio also provides the capability to interface with the R language. SAS/IML Studio runs on a PC in the Microsoft Windows operating environment. SAS/IML Studio is distributed with SAS/IML software. The product page lists other resources such as training opportunities, books for sale, samples, and social media outlets for SAS/IML Studio. Related SAS Press Books available for purchase in the online bookstore.